The Grade II listed Scenic Railway at Margate’s Dreamland Amusement Park is the oldest surviving roller coaster in the UK, and one of only two in the world. Opened in 1920, it still requires a brakeman to travel with the train to control its speed as there are no brakes on the track. In April 2008 around 25% of the structure was destroyed after an arson attack, including the station, storage sheds and trains. In 2009, the Dreamland Trust was awarded a grant by the UK Department for Culture Media and Sport to restore the Scenic Railway and to develop the Dreamland Site into the world’s first Heritage Amusement Park. 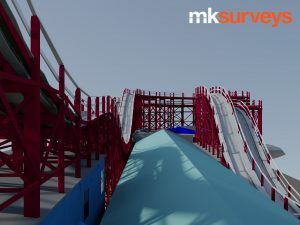 MK Surveys, independent land and measured building surveyors, were approached by consulting engineers acting on behalf of the Park’s owners and asked to produce a three-dimensional survey of the remaining structure. Subsequently the project was taken over by the Dreamland Trust, which included Thanet District Council. The Council appointed MK Surveys alongside Gardiner & Theobald (Project Managers) and Campbell Reith (Consulting Engineers) to assist with restoration works. Established in 1972, MK Surveys are based in Milton Keynes and have satellite offices in Oxford, East Midlands, West Midlands and Horsham. They were instructed to produce a three-dimensional CAD model that accurately detailed the existing structure. This would provide the basis for its restoration and for the remodelling and design of the section destroyed by fire. A large amount of modelling was required and included curved timber bracing. In total 600m of track was modelled, with over 5000 timber components modelled on frame and over 10,000 3D objects / faces modelled in total. The survey was overseen by a senior surveyor with a team of three surveyors / trainees using a laser scanner and Total Station. All scan positions were controlled via traversing and targets were positioned over the structure to enable accurate stitching of all the individual scans to create the final point cloud. In just four days on site, they recorded a total of 49 scans (280 million points), measured the internals of the remaining buildings, recorded a basic topographical survey using conventional methods, and recorded 780 digital photographs. The data processing was carried out by the same team of surveyors over the following nine weeks. 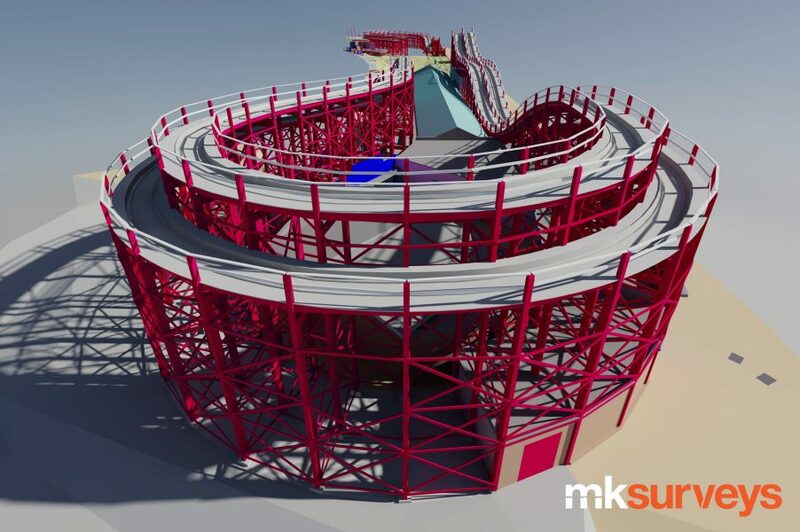 Using laser scanning, MK Surveys were able to capture much more detail than traditional methods allow, and in a far quicker timeframe, so saving time and money for the client. The restoration works were completed in 2015 with the ride re-opening to the public on 15 October of that year.